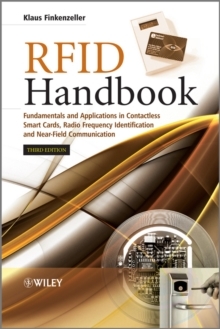 This is the third revised edition of the established and trusted RFID Handbook; the most comprehensive introduction to radiofrequency identification (RFID) available. This essential new edition contains information on electronicproduct code (EPC) and the EPC global network, and explainsnear-field communication (NFC) in depth. It includes revisions onchapters devoted to the physical principles of RFID systems andmicroprocessors, and supplies up-to-date details on relevantstandards and regulations. Taking into account critical modern concerns, this handbookprovides the latest information on: * the use of RFID in ticketing and electronic passports; * the security of RFID systems, explaining attacks on RFIDsystems and other security matters, such as transponder emulationand cloning, defence using cryptographic methods, and electronicarticle surveillance; * frequency ranges and radio licensing regulations. The text explores schematic circuits of simple transponders andreaders, and includes new material on active and passivetransponders, ISO/IEC 18000 family, ISO/IEC 15691 and 15692. Italso describes the technical limits of RFID systems. A unique resource offering a complete overview of the large andvaried world of RFID, Klaus Finkenzeller s volume is usefulfor end-users of the technology as well as practitioners in auto IDand IT designers of RFID products. Computer and electronicsengineers in security system development, microchip designers, andmaterials handling specialists benefit from this book, as doautomation, industrial and transport engineers. Clear and thoroughexplanations also make this an excellent introduction to the topicfor graduate level students in electronics and industrialengineering design. Klaus Finkenzeller was awarded the Fraunhofer-Smart CardPrize 2008 for the second edition of this publication, whichwas celebrated for being an outstanding contribution to the smartcard field.